Hey Nyagoslav, thanks for weighing in and for your compliments! I completely agree that conversions are most important, though (to me) they’re the ultimate goal, rather than something you might see on the way to reaching the goal. Obviously you’re probably on the right track if you know for a fact you’ve got new customers as a direct result of Google Places visibility. As you said, that’s an unmistakable (the “ultimate”) milestone. But if you’re not at that stage yet, it’s tough to know if you’re doing things right (as we both know). Hence my short list of milestones, which can help if one doesn’t yet have any insights into conversions. I kind of think of it as a game of Marco Polo. If you’re “it” and you’re able to tag someone, you know you’ve won that round. But you know you might be getting close if somebody yells “POLO” right in your ear and you feel a bunch of splashing that isn’t coming from you. It’s something to go on. If I would start a new local business right now, i would just get myself two local (!) phone numbers. One for Online and one for offline. So that you can at least compare those two different marketing channels by just logging your incoming calls. … and even that can get complicated if your “offline” phone number gets transferred to online by bloggers, customers, etc… it’s a pain in the *** actually. You pretty much hit the nail on the head, regarding the ins-and-outs of trying to track calls in GP. As you know, it’s been an issue for a long time, and doesn’t seem to be getting more practical. Thanks for the info on how to avoid messing up the NAP with the extra number. The other way to do this, of course, is just to make the number into an image. I’d certainly like any further thoughts you have on how people can track calls practically and without fear of Google’s wrath. First and foremost awesome discussion you have started here. We are in our infancy stage of offline marketing. Been in the business for a while just never public. Anyway tracking is the key and as you just mentioned while a tracking phone number is great it certainly can get your clients into some ranking issues. Outside of some link tracking your best option would be incentive tracking. Producing some incentive for the customer if they tell you they were there along with a review portal. Things such as “Mention our website and get some discount” and encouraging review / feedback is another indicator of your marketing. It still is a very fuzzy area that needs to be addressed if only for the simple fact of gauging the effectiveness. I couldn’t agree more about incentive-tracking. Also, the more granular, the better: if you have an offer that only people who go to your Places page will ever see, and a separate offer that only people who go to your Adwords landing page can see, then that’s great. One way I’ve seen – and I’m sure you’ve seen – people do this is with photos. Occasionally I’ll see a Places page with a prominent photo that says “Mention this page and get 10% off” or something. Obviously, this isn’t quite as good as call-tracking, but it’s better than nothing. Another way to do this is with KISSInsights. You have an unobtrusive pop-up survey in the corner of some of the pages on your site, which asks “How did you find us?”, with a few options people can choose from. But, as you said, it’s still a fuzzy area. Let’s just hope Google eventually makes some provision for honest business who just want to learn more about their customers rather than game the system. Great post. I really like that you broke the steps down into milestones. The duplicate listing consolidation process is key and your right…your going to be stuck till that milestone is passed. 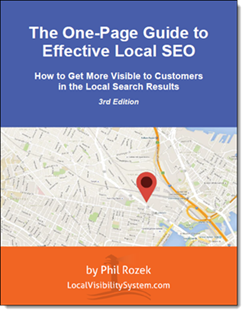 One item in this list can also be “Visibility” of the Google Places Local Listing on various keywords, in a location. We had the opportunity to work with one gentleman and before we worked for him his Google Places Local Listing never appeared on “Google” or “Google Maps” and after the execution he his listing is seen for different keywords in his location. True enough, although because visibility for search terms (like the ones you mentioned) is the goal, it’s not really a “milestone” per se. Although I do agree that ranking well for city-specific search terms (“retirement planner Addison TX”) is usually a good sign that you’re on your way to ranking well for broader terms (“retirement planner”). Eagerly waiting for the post.